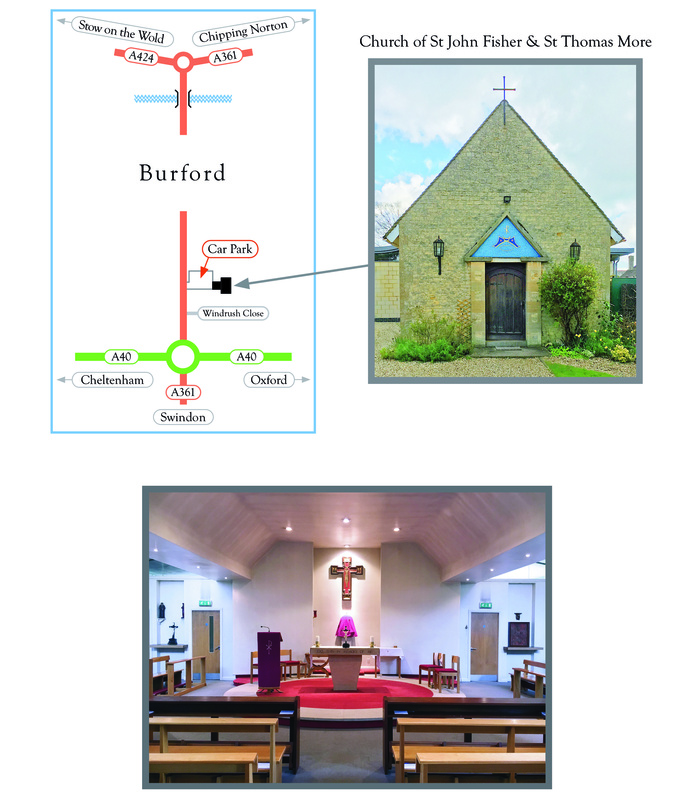 In the 1930s a Mass Centre was established in the grounds of a house belonging to Mr & Mrs Littledale, whose son Arthur was ordained priest in 1935. A wooden hut served as a church for the small congregation. In 1952 the runway at Brize Norton airfield was lengthened for a new generation of aircraft. The contractors recruited some Irish labourers, who were accommodated in huts at Bradwell Grove, about a mile away. They usually attended Sunday Mass in Carterton; but one snowy day they were unable to get there, and had to walk to Burford instead. There were too many of them to fit into the church, and after Mass Fr Littledale expressed his regret for the lack of space; so they offered to build him a new church. This they did in their spare time, raising the walls to the level of the roof before their contract ended and they all dispersed. Fr Littledale himself funded the completion of the church, commemorated by the inscribed tablet on the wall above the door, as well as the Presbytery; after his death in 1976 his family generously bequeathed the land in his memory in order to establish the Parish. The Church was enlarged in 2003 by the addition of two wings, the remodelling of the Sanctuary and High Altar and other changes including a w.c. and ramped side entrance for the disabled. The original nave and porch and the statue of Our Lady outside, comissioned by the Irish builders, still remain as witnesses to their charity and devotion.